CatDrive is a new product from Halos that is currently in crowd funding on Indiegogo. The concept is fairly simple, a private storage device that is designed to be a multi-user, auto back up device you can access from anywhere. Since it is your own device you won't be paying monthly fees for cloud storage either. The CatDrive has a rather unique shape considering it has a standard laptop drive inside. Rather than the typical rectangular shape of most enclosures, this unit is round. Inside the white or black housing is a 1TB 5400 rpm drive, with a dual core processor and 512MB of DDR memory. It also has a Gigabit Ethernet port for simple connection to your network. Below are some detailed specs from their website. The CatDrive comes well packaged in a mainly black rectangular box with a full color image of the drive on the front with the capacity printed on the top right. The back of the sleeve reviews several of the key functions of the device. Removing the sleeve reveals a very sturdy black and blue box. Lifting the cover you'll find the CatDrive unit neatly stored in a foam block. Below that is a small cardboard box that houses the accessories. 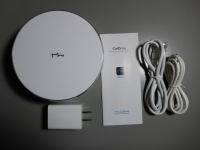 The unit comes with an instruction booklet, AC adapter, power cable, and Ethernet cable.